Beltane Ranch, an inn and winery in Sonoma County, California, has been in Lauren Krause's family for five generations. On Sunday night, she watched the property burn. In the end, Krause says she was fortunate. 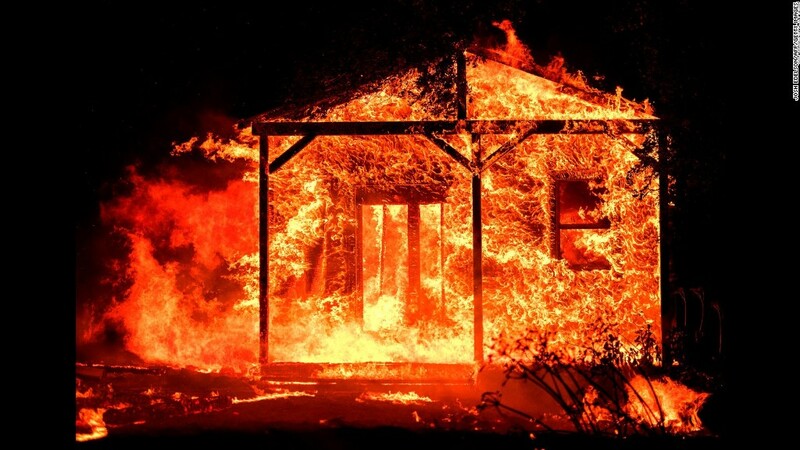 She had time to save her house by dousing it in water. But the blaze consumed much of their wine, sheds and equipment -- along with all their guests' cars. "We had hours of real, gut-wrenching fear that we were going to lose everything," Krause told CNNMoney. The dozen or so guests staying at the homestead were all safely evacuated, Krause said. And her mother, brother, husband and two sons made it out of their homes unharmed. "I wish I could take some of the losses that other people are suffering," she said through tears. "My son's preschool teacher lost her house." In the past 36 hours, wildfires have whipped across Northern California wine country, burning tens of thousands of acres of land. Already, officials estimate that at least 2,000 homes and businesses have been destroyed, and 15 people have died. It's too early to fully tally the human and economic costs of the disaster. But it's almost certain to scar a region that relies heavily on its tourism and wine industries -- especially since business owners aren't sure when they'll be able to operate normally again. "We have a lot of upcoming commitments with wine we have to figure out," Krause said. Beltane Ranch typically sells about 1,500 cases of wine per year. Sonia Byck-Barwick, who runs the Paradise Ridge Winery in Santa Rosa with her brother, Rene, said their property is completely burned, from the tasting room to the events center. They'd already picked all the grapes for the season. Those are gone now, too. 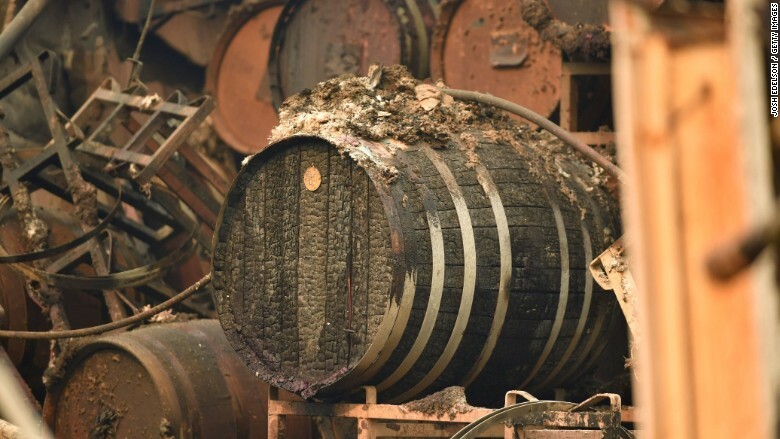 Burned wine barrels at the Paradise Ridge Winery in Santa Rosa, which has been destroyed. Byck-Barwick said she plans to turn a small building on the property into a tasting room so Paradise Ridge can stay open. But it might be two years before they're able to rebuild to a point where they can host weddings again. "It's important that people don't stop coming because of this," she said. "We're going to need people to come. We're going to need people supporting us." According to the Napa Valley Vintners, a local trade association that conducted a preliminary survey of its members, at least four wineries suffered "total or very significant losses due to the fire." Nine others reported damage to their wineries, outbuildings and vineyards. But the true extent of the devastation is not yet known. Many are still in triage mode. "Assessments of vineyards and wineries cannot be made until the fires are contained," the Wine Institute, an advocacy group for the California wine industry, said in a statement on Tuesday. Most of the season's crop has already been harvested. Napa Valley Vintners said it believes that 90% of the region's grapes were picked before the fires began Sunday night. But for the fruit remaining, there's some risk. Many growers are worried about "smoke taint." This can occur when grapes are exposed to smoke while they're still on the vine -- causing them to develop an ashy taste profile. "If [smoke taint] does settle in, those grapes couldn't be used for what they're typically used for," said Daniel Sumner, a professor of agricultural economics at the University of California, Davis. He estimates that up to 10,000 acres of vineyards have the potential to be affected. Smoke taint is a particular concern for William Bucklin, the owner of Old Hill Ranch in Sonoma Valley. His office and a guest house both burned down. Luckily, Bucklin's vineyard is mostly intact, and the majority of the harvest at his 40-acre property has already been completed. What's left on the vine, though, is valuable -- his Cabernet and the Petite Sirah grapes. "The grapes are going to be inundated with the delicious flavor of smoke," Bucklin said wryly. -- CNN's David Williams contributed to this report.